What shutdown? Job growth unexpectedly surged in October, even as the federal government closed its doors for 16 days. 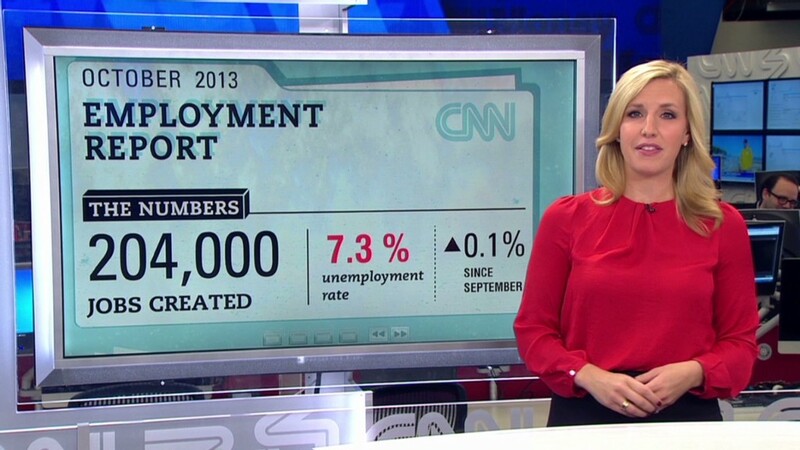 The U.S. economy added 204,000 jobs, according to the Bureau of Labor Statistics. That was well above economists' expectations. Plus, there was more good news about hiring during the late summer. 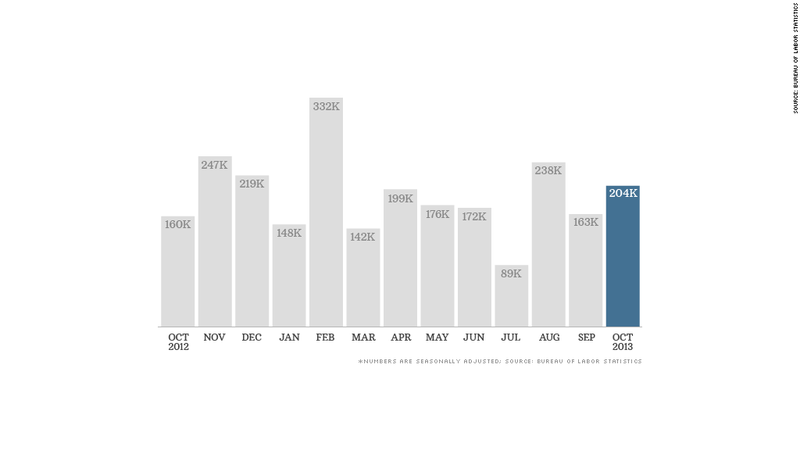 Revisions showed an extra 60,000 jobs were created in August and September. "The economy seems to be heating up faster than people think. It's incredibly impressive," said J.J. Kinahan, chief strategist for TDAmeritrade. Economists were expecting weak job growth due to uncertainties created by the budget battles in Washington. The federal government shut down on Oct. 1, after Congress failed to agree on a budget for fiscal 2014. The standoff lasted 16 days and left as many as 800,000 federal employees temporarily out of work. But the Labor Department noted "there were no discernible impacts of the partial federal government shutdown" on the job growth numbers. The numbers were also strong enough to get Wall Street talking once again about when the Federal Reserve should start slowing its stimulus program. The Fed has been buying $85 billion in bonds each month since September 2012, in an effort to strengthen the job market. Share your story: What's your biggest job search mistake? Given the government shutdown, many Fed watchers were starting to think the central bank would continue its stimulus at full blast until at least spring 2014. The Fed next meets at the end of December, and the strong jobs report could mean officials will consider reducing their monthly bond purchases sooner rather than later. "Once again the U.S. economy appears to be overcoming a summer swoon," said Paul Ashworth, chief U.S. economist for Capital Economics in a research note. "In our opinion, the data would justify the Fed reducing the pace of its asset purchases in December." The outlook isn't all rosy though. Overall, the economy has still not recovered all of the jobs lost in the Great Recession. The jobs report also showed the unemployment rate rose slightly to 7.3%, up from 7.2% in September, but economists expect this to be a passing blip. About 448,000 furloughed federal workers were counted as being on temporary layoff, and the next jobs report, due on December 6, will probably show these people were back at work in November. Meanwhile, only 62.8% of Americans over age 16 either had a job or looked for one. That's the lowest level since March 1978. Economists also believe this number was impacted by furloughed federal employees but nevertheless, it has been hovering around the lowest levels since the 1970s for months. Heidi Shierholz, an economist with the Economic Policy Institute, estimates roughly six million workers are missing from the labor force, and if these workers started looking for work again, the unemployment rate would be closer to 11%. Overall, about 11.3 million Americans were counted as unemployed in October -- 4 million of whom have been out of work for at least six months. Where are the jobs? Job gains came across a variety of sectors. Retailers added 44,000 jobs, professional and business services also added 44,000 jobs, restaurants and bars hired 29,000 workers and manufacturers added 12,000 jobs. Meanwhile, the federal government cut 12,000 jobs -- a third of which were at the U.S. Postal Service. Excluding the postal service, federal jobs were at their lowest level since 2009.